Chris is involved in a little bit of everything the communications team does, but focuses primarily on Magic Duels and running the social media accounts associated with that. So mostly that means he has way, way, way too many internet browser windows open at once. After more than a month of playing Oath of the Gatewatch Limited, you probably have an idea of the cards you're excited to crack open and which archetypes to play. Chandra or Kalitas would be a slam dunk, but an Isolation Zone or Oblivion Strike is definitely a fine way to start off a draft. You've studied the archetypes, you know your pick orders, and you know what to expect from your opponents when you sit down across the table from them. What about a slightly more challenging pack 1, pick 1 scenario? What are you most looking forward to opening in a Theros-Mercadian Masques-Future Sight draft? Do your choices change if the drafter to your right is about to open Return to Ravnica-Magic 2013-Tempest? Today we're going to talk about chaos drafting, and hopefully make some sense out of the question above. Let's dive in! Chaos Draft is just like any other Magic Draft format: get together with seven of your best drafting buddies and grab three packs of cards for each drafter. The twist is that instead of drafting a normal format—two packs of Oath of the Gatewatch and a pack of Battle for Zendikar, or three packs of Magic Origins, or any of those other carefully crafted formats—you cobble together as many different packs from different sets as you can scrounge up and distribute them randomly among your players. Maybe you forgot to crack open a pack of Fate Reforged from last winter's FNM prizes, or a mysterious benefactor left you with an entire box of Champions of Kamigawa. Maybe a stork visited your home and left a fat pack of Avacyn Restored on your nightstand (this is how I receive all of my new cards). Chaos Draft is the perfect excuse to gather up all the different sealed product you or your local game store has and throw it into a Limited maelstrom. If you don't happen to have stacks of old packs around (again, no-judging zone), chaos drafts are also a popular format for side tournaments at the Magic Grand Prix. If you were looking for one more reason to go to your next major Organized Play event, consider the madcap joy of sitting with a few dozen other players in a side event improvising their way through the mad science of Draft formats. Some of my best experiences playing Magic have been working my way through this hodgepodge of cards from Magic's decades-long history, and hopefully some of the experiences I'm sharing today will encourage you to give the format a try—and give you an idea of how to approach it. One of the more entertaining things about Chaos Draft is that you get to mix and match some of the most powerful Limited cards in Magic's history and see them played against one another. That is, if you recognize them. Let me lay out the scenario: Some friends and I arranged to have a chaos draft in an old Boy Scouts hall on Vashon Island in the Puget Sound. We were surrounded by shelves of old books (and old book smell) and sitting on old folding chairs at a folding table possibly older than the game of Magic itself. The catch—and I cannot emphasize just how not-great of an idea this was—was that every one of our packs was in a non-English language. Needless to say, the draft process required all of us to make liberal use of Gatherer's visual spoiler function. A brisk two hours later (again, this might not have been the best way to implement a chaos event), our draft was over and we had our decks. My friend Nick then told us he was surprised that he wheeled a Pestilence from the French pack of Fourth Edition. 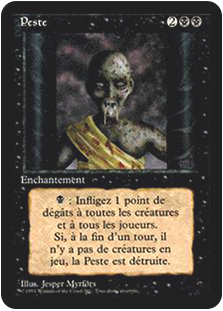 For some people, Pestilence is just a black enchantment with creepy art; for others, it's the painful memory of an Urza's Saga draft gone awry. For me, it was a four-mana enchantment with some French rules text on it that didn't seem worth looking up. It turns out there's a reason you don't see effects like Pestilence's at common anymore, and we were all about to feel a little silly for passing it. Nick spent the rest of that draft making sure that no one had any low-toughness creatures in play, which happens to be a potent draft strategy! We spent the rest of the afternoon happy that Naturalize and Disenchant have seen so many reprints throughout the years. The takeaway here is that Chaos Draft rewards you for having a solid understanding of the standout Limited cards from Magic's past. Last December, resident Limited expert and fantastically tall person Marshall Sutcliffe analyzed Battle for Zendikar through the lens of archetypal Magic cards—your Terrors and Grizzly Bears and such. If you know what kind of packs you'll encounter in your next chaos draft, it's a huge help to perform this kind of exercise with sets you're unfamiliar with. Even having a passing understanding of the sets you'll encounter will go a long way toward understanding signals from your fellow drafters and optimizing your picks. It also doesn't hurt to stay safe with traditional Draft strategies—bombs, removal, evasive creatures, and burn spells will be great in any format. Alternatively, learn basic French. You never know when it will be handy. The corollary to this is that the nature of Chaos Draft means that you'll be playing with cards that you aren't familiar with, and the power level of individual cards in your deck will vary wildly. This means that games in Chaos Draft tend to go a little long—between the natural speed of the format and the time players will need to get acquainted with each other's cards. With that in mind, prepare to be surprised by cards you never would have thought were exciting before. Shock Troops? It's a 2/2 that goes to the dome! Thermal Glider? That's some sweet tech against your opponent's Shock Troops! Thresher Beast? It may as well be unblockable! At this same draft, I ended up drafting a primarily red aggressive deck with some white creatures to supplement my burn plan. After first-picking a Sulfuric Vortex from a pack of Scourge, I knew that I had to see how the Cube all-star performed in Limited. The red cards were flowing from both directions, though I was inexplicably a little light on creatures. Round two, I sat across from my buddy Margot, who laid down a turn-one Goblin Arsonist into a turn-three Mercadian Masques Arms Dealer. So that's where my creatures went! And what a snazzy, synergistic set of first plays! Delightful! This is totally fine and certainly not a sign of bad things to come. I am on actual fire and all of these Goblins are now unblockable. Several Goblins and sacrifice triggers later, I had been run over by what can only be described as an explosive history of Magic's tiny green critters. 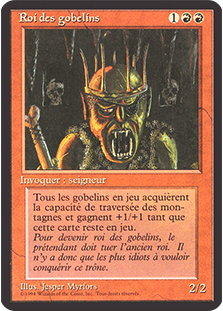 It turns out Arms Dealer was Margot's first pick, and the pack that contained the dastardly Pestilence from before also had the Goblin King. Lesson learned: while safe fundamentals can take you far in Chaos Draft, don't be afraid to take risks on synergies that reach across sets. In Margot's case, this meant going in on tribal interactions from one of the most prevalent creature types in the game, but there are plenty of other game mechanics that work across Magic's history. Sultai delve cards from Khans of Tarkir are happy to see Golgari dredge creatures, and the metalcraft on Rusted Relic doesn't care if your artifacts were printed three months ago or ten years ago (here's looking at you, Icy Manipulator). The flip side of this lesson is that it's best to avoid cards with mechanics that have a narrow focus. While constellation creatures like Oakheart Dryads were great in the enchantment-themed Theros block, they become much less exciting when your deck might only have a few (if any) enchantments in it—Pacifism and friends aside. If you do decide to go in on constellation cards, or infect creatures, or splice onto arcane spells, recognize that they might have to be a sub-theme to your deck rather than the key strategies from their original Draft formats. And a pro tip to those setting up a chaos draft: help your playgroup avoid these kinds of scenarios by limiting the number of packs you include in your draft from "small" Magic sets that came out later in a block's life cycle. Often as a block goes on, its individual sets become more insular with themes and mechanics, which makes for fun and unique play experiences but often a frustrating chaos draft. There's plenty more to discuss about this Draft format, but hopefully I've done enough to pique your interest in Chaos Draft. There are few things in Magic that require as much improvisation and nimble thinking, and it makes for an experience like no other. At the very least, you won't look at Shock Troops the same way again.